What's next for The Beast Incarnate? Summerslam is perhaps the biggest wrestling pay-per-view of the year, right behind Wrestlemania. The event saw a ton of title changes, but the biggest one was the Universal Championship: Roman Reigns defeated Brock Lesnar to win the belt. The move did not receive a lot of love, as Reigns was booed. For a long time now, Brock Lesnar has been a very polarizing figure within The WWE. The big question now is: What’s next for Lesnar? There are speculations going around that Lesnar will go back to the UFC, where he has spent a giant chunk of his career. Lesnar was back and forth between WWE and UFC for years, so a jump back into the octagon would not be a huge surprise. Eventually, it will most likely come down to who wants to offer Lesnar more money. Currently, Lesnar’s WWE contract stands at 20 million dollars. Right before he left UFC he was making 18 million dollars per year. Many critics say that Lesnar only cares about the money, and will go to the company that pays him the most. That has also certainly become Lesnar’s character, as he is often accused of only caring about how much his bottom line is going to be. Some speculate that Lesnar may just take a break (as he has done many times before) and come back towards the end of the year. Lesnar has been in the WWE for over 16 years, but he has been going back and forth since 2005. The first time he departed WWE was after a very poor Wrestlemania match against Bill Goldberg. There is no doubt that money will play a role in Lesnar’s decision. Some blame falls on the shoulders of the WWE. The company has allowed Lesnar to essentially treat World Wrestling Entertainment as a revolving door in which he can come and go as he pleases. 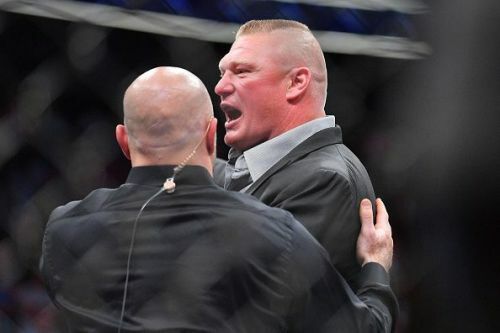 McMahon has always been a friend and strong supporter of Lesnar and has allowed him to paid a great deal of money while only working a few days a year, mostly at major pay-per-views like Summerslam and Wrestlemania. Lesnar has taken advantage of this opportunity and split his time between UFC and WWE. Where will Lesnar end up? If I were to make a prediction, I would say that Lesnar will take off for about six months and come back at Wrestlemania or possibly Royal Rumble. Lesnar lives for the spotlight, and those are the two biggest pay-per-views for the WWE. Despite his long absences from the company, the WWE die-hard fans always seem to welcome him back with huge pops, and he never gets booed. Lesnar has some thinking to do in the next few months, but still has plenty of time before The Royal Rumble in January.